Proprietary Name: 5257 Hand Sanitizer What is the Proprietary Name? 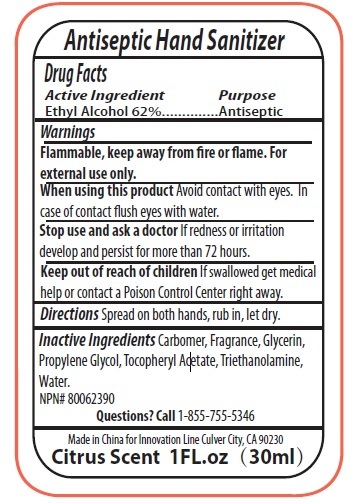 5257 Hand Sanitizer with NDC 76138-121 is a a human over the counter drug product labeled by Innovation Specialties. The generic name of 5257 Hand Sanitizer is ethyl alcohol. The product's dosage form is gel and is administered via topical form. Active Ingredient Ethyl alcohol 62%. WarningsFlammable, keep away from fire or flame.For external use only.When using this product Avoid contact with eyes. In case of contact flush eyes with water.Stop use and ask a doctor If redness or irritation develop and persist for more than 72 hours. DirectionsSpread on both hands, rub in, let dry. Inactive Ingredients Carbomer, Fragrance, Glycerin, Propylene Glycol, Tocopheryl Acetate, Triethanolamine, Water.